The Internet is the part of our daily life. We spend hours in browsing Facebook, Twitter, YouTube and other websites every day. 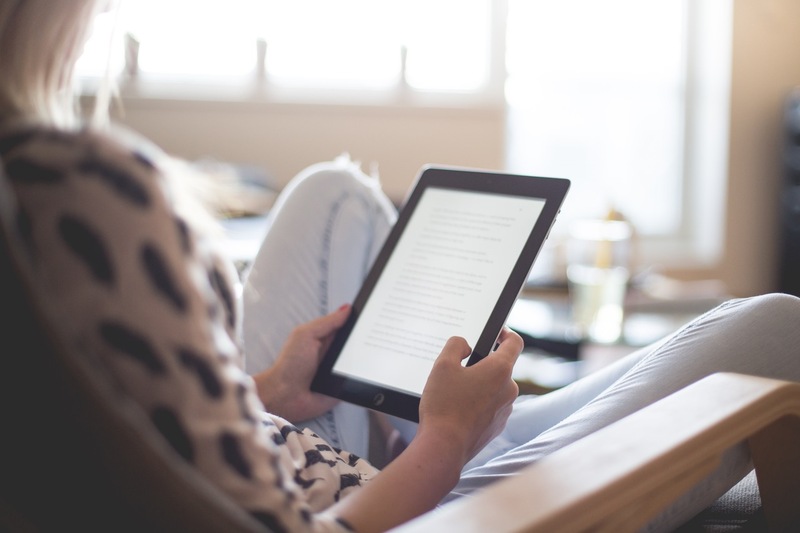 Have you ever thought to know how much time you spend on Internet daily? If you use Google Chrome for your Internet browsing, you can try Web Timer Google Chrome extension to check how much time you spend on the Internet daily. With this extension, you can also check how much time you spend less productive websites like Facebook and YouTube. Download and Install Web Timer Chrome extension from Google Chrome Web Store. After installation, it adds a clock icon in the Omni bar. Clicking on this icon display the time you spend on the Internet. Just after installation, it starts tracking what websites you visit and how many minutes you spend on what websites. It has a background timer to track the time you spend on Google Chrome. And this timer only works if Google Chrome is in focus. If you are using any other tool leaving Chrome idle or your system is idle, it wouldn’t count the time in your browsing. 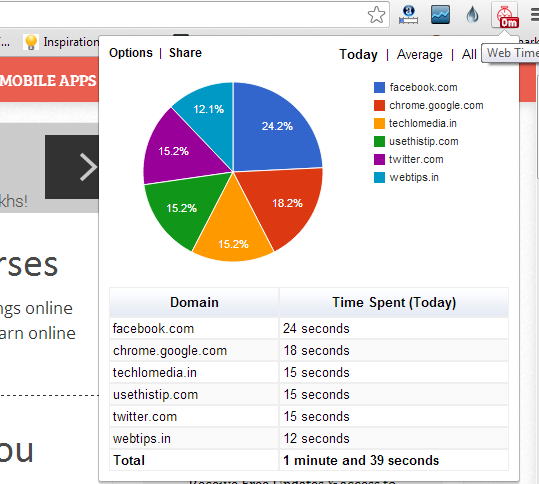 It displays the reports in the pie-chart form and lets you share the data with friends on Facebook. You can check the total time spent on a website and total time spent on the Internet daily. 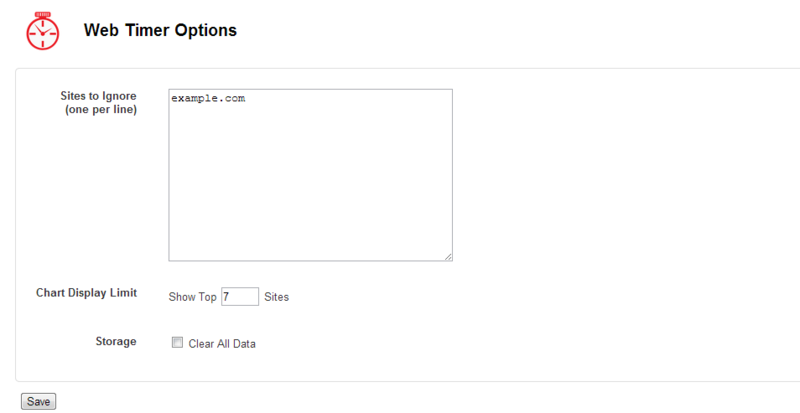 If you do not want to track time for few selected website, you can create the custom list of website. And it will not count time for those websites. Right click on Clock icon and then select ‘Options’. Here, you can create the list of the website which you want to ignore. You can also set the chart display limit. The default is 7. It is worth to note that it stores data in your browser’s local storage. It never transmits your browsing history to any third party website. So, you should not worry about the privacy. Try this extension and start tracking your online activity. The Internet is useful but we should not be too addicted to it. We should learn how to manage our time and become productive. Just because you love chatting and web browsing, you should not ignore other tasks. Physical work is important as a well. This Chrome extension will help you in knowing your browsing behavior. you can use it to analyze your time and then stop using time waste websites.